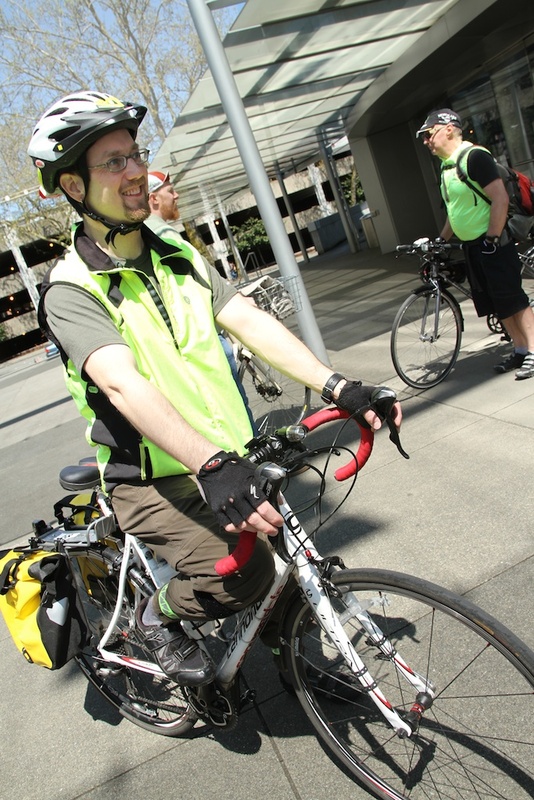 The weather was so nice on Thursday, Seattle Opera's bike-to-work team got together for a little pizza party and a few photos outside McCaw Hall. 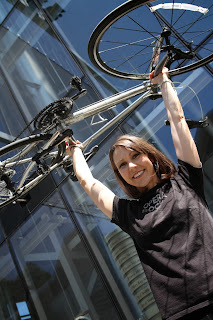 (Left, Online/Audience Development Manager Aubrey Bergauer shows her spirit.) 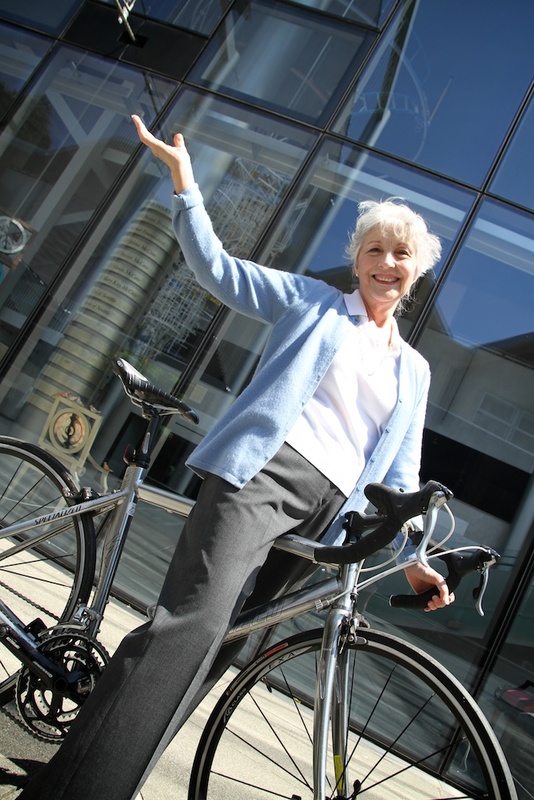 We have quite a few employees who bike to work year-round at our main headquarters in South Lake Union, where our rehearsal studio, costume shop, and administrative offices are located; others bike to work at the scenic studio in Renton; and some performers even bike to work at the theater. For several years, Seattle Opera has participated in the Group Health Bike-To-Work Challenge in May. 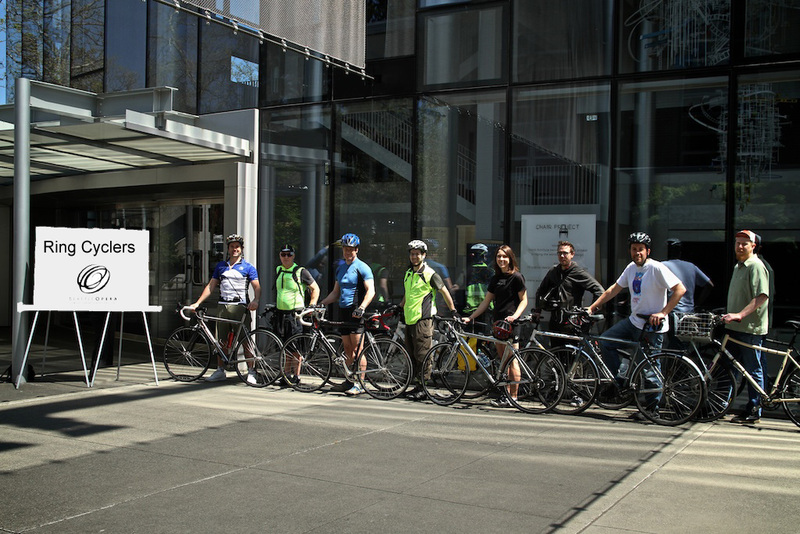 This year so far, our team (which includes commuters who come from Bellevue and Redmond) has logged several hundred miles of bike commuting. And a handful of Seattle Opera staffers are either STP (Seattle-to-Portland) veterans or aspiring hopefuls! 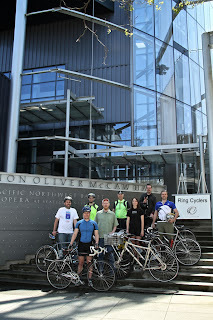 The team, ready to file in to work. 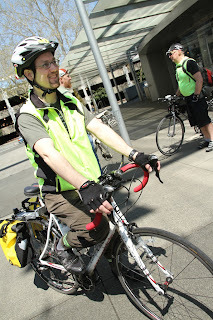 Team captain Iain Quigley is Seattle Opera's Desktop and User Support Technician. Public Relations Coordinator Monte Jacobson got in on the fun. The "Ring Cyclers" this May included tenor Jonathan Boyd, who sang a terrific Tamino last night, and baritone Philip Cutlip, who appears tonight as Papageno. Since performances began, Cutlip has had a chance to explore some of King County's fabulous bike trail system. Boyd's bike, for these photos, provided by Cadence Winery. All photos by Alan Alabastro. -entrance to the Theater (I use the word "personnel" rather than "artists'" as the bikers include not only thw artists, but also staff and volunteers (like the Lovely Librarian and me). Best regards to SeaOp's bikers!! !